We cannot control when bad things happen to us. Unfortunately, pain is inevitable. But dwelling in misery is optional. We can choose to view the brighter side of a difficult situation and create birds of paradise instead of sadness. 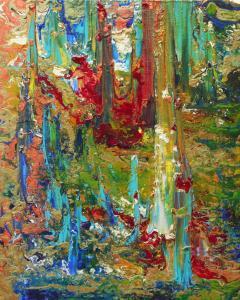 This painting is a tropical aviary of peaceful energy. It is a vibrant representation of paradise--a colorful atmosphere reminding us to seek the positive and overcome adversity. Welcome to Spring, the season of re-birth and the awakening of life. On the hottest day of any given year, the heat of a Rusted Sun spreads across the atmosphere as if it restrains itself from bursting into a blaze. This remarkable sphere contains all the beauty and energy of the most prehistoric fires. 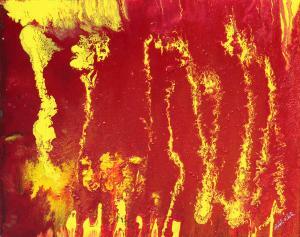 The yellow flares against the dark crimson surface remind us of molten and the smoldering conception of a fiery planet. Sometimes we need to gather our resources together and to build up energy for the demands of our lives. To harbor the forces within us before we take direct action. The key is to never let those energies and passions die within us. Sometimes our circumstances prevent us from tending to our innermost desires. Sometimes we must be patient in the face of our responsibilities, and delay pursuit of our dreams. It is up to us to keep those dreams healthy and alive, to keep them from rusting in our spirits so that when the time is right we may go forward with confidence. Praying or meditating is a practice or discipline in the everyday lives of many people. To say that paintings are prayers is such a great comparison. Some paintings are like dreams or far away places that one would go to escape reality. Meditating or praying for something different to happen is like escaping into a dream. You lose yourself for a moment and long to be in another realm. 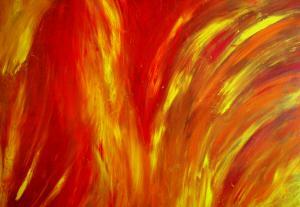 'Spirit Dance' is a painting which you could easily meditate on and allow it take you beyond the colors. It is uplifting and transcends a hopeful outcome. Meditate on something inspiring today. Give your spirit a refreshing boost! Wanderlust is an intense desire or impulse to travel. We travel to be enlightened and to experience new adventures. We travel to find love. We travel to fill our souls with purpose and to overcome fears. This painting is a lively collage of memories and footprints that I’ve created along my path of life. Seas, sunsets, and stars. Moments without words etched into my soul. Adventure awaits you. Make wandering a new habit! A spindrift is the spray or mist of the sea from the crests of the waves by the wind. 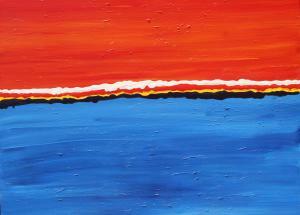 This painting is called 'Spindrift' as it highlights the strengths between the sun, the sea and the wind. 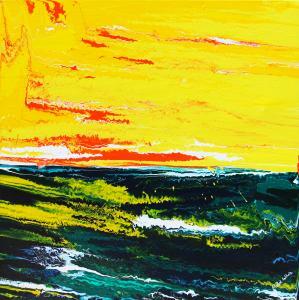 The colors are exaggerated to describe the majestic setting of the sun into the colossal depth of the sea to create a universal connection of power between these energetic forces. During a lifetime of spiritual study and experience, I’ve become deeply influenced by the power of possibility. I devote much of my artistic expression to visual images of human intention and the necessary connections between action and purpose. In Spring of 2006, I was searching for the essence of the authentic soul. 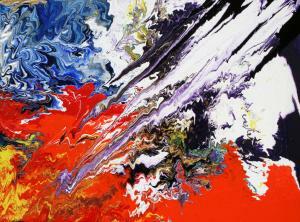 In this work, I attempted to express the extraordinary elation that accompanies human transformation. The bold colors in this painting command attention to what is happening within. 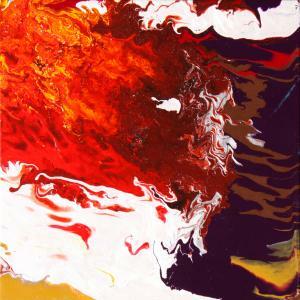 The blending of red, orange and yellow signify the intensity and power of the experience. It is as though once acknowledged, the force of intention liberates the soul’s energy into the world, into decisive and positive action. There is a mighty sense of release in this painting. I’d like to encourage you to liberate the power that lies dormant within your soul. This painting reminds us that this is not only a rewarding journey, but a necessary one. In my painting Aurora, I celebrate the eternal bond between earth and sky, and seek to blur the boundaries between them. Earth is our home and the sky is our playground. This divine relationship is older than history and shape the fabric of who we are and what we believe. Aurora depicts a loving connection of natural elements and encourages us to create these connections in our souls. Genesis is the point at which something comes into existence. This painting is a bold re-imagining of creation of the universe. It reveals the exact moment in which light and color were conceived. This powerful piece is a tribute to the handiwork of any genius. Whether it be art, music, poetry, architecture, etc., the root of any idea or concept is faith and passion. May your undiscovered passion come into existence and bring you joy. 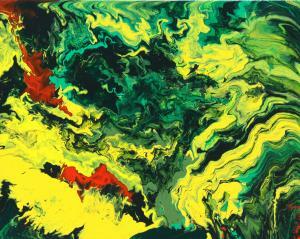 This bold painting challenges us to simplify our objectives. The complex essence of sea and sky is set down as two distinct elements. We are immediately drawn to the line that separates them--to the threshold, the place just between. 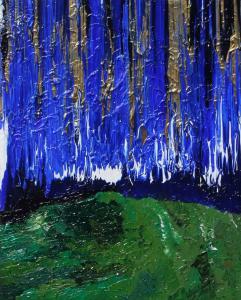 This work strives to delineate this intangible area where nature cannot be broken apart. A finite stripe linking heaven and earth causes us to define our perception of each. Think of the two elements as your spiritual and practical beings. Can we move easily from our soul’s intention to reality? Can we cross the threshold of our imagination and return to put these ideas to productive use? We must push ourselves to the threshold to discover and fulfill our authentic soul. The beauty of life lies beneath the surface. Sometimes what we see on the exterior is only a fraction of what is all there. When you look at the ocean from a hill, you see a vast expanse of water. But when you dive into the depths of it, you experience the hallmark of the spirit. 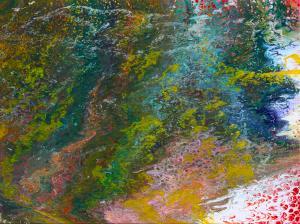 This painting is called 'Reef' as it illuminates the depths of beauty in the sea and brings imagination to the spirit.